Have you ever dreamed of quitting your day job and seeking an occupation filled with pure joy? Take inspiration from the story of Peter Brydon, master chocolatier of Barlovento Chocolates. After 28 years in the printing business, he decided on a whim to become a chocolate maker! It was at the Berkeley Farmers' Market in August 2003, when Brydon tasted a Smit Farms dried cherry that called to him for the right chocolate coating. This led to experimenting with chocolate in his own kitchen. Later he enrolled in the Ecole Chocolat's four-month Professional Chocolatier Program, and then he started working at a shop called Serendipity, fitting of his fortuitous pathway into the world of chocolate. A true artisan and a purist with dedication to quality, Brydon uses only the finest ingredients including single-origin chocolate from Criollo and Trinitaro cocoa beans. This specific type of bean, grown in the Barlovento region of Venezuela, is among the world's most prized cocoa beans. Brydon excels at creating exquisite ganache (creamy chocolate filling) with wonderful flavors. His secret is infusing the chocolate filling with fresh herbs and spices from the farmers' market, such as aromatic mint leaves, vanilla beans, cardamom and tarragon. During winter, when mint is less fragrant than in springtime, he compensates by adding more leaves. The Meyer Lemon truffle is flavored with zest of lemons from Oakland residents' gardens (offered in exchange for chocolates). Barlovento Chocolates is a delightful discovery for those who love European-style dark chocolate truffles. 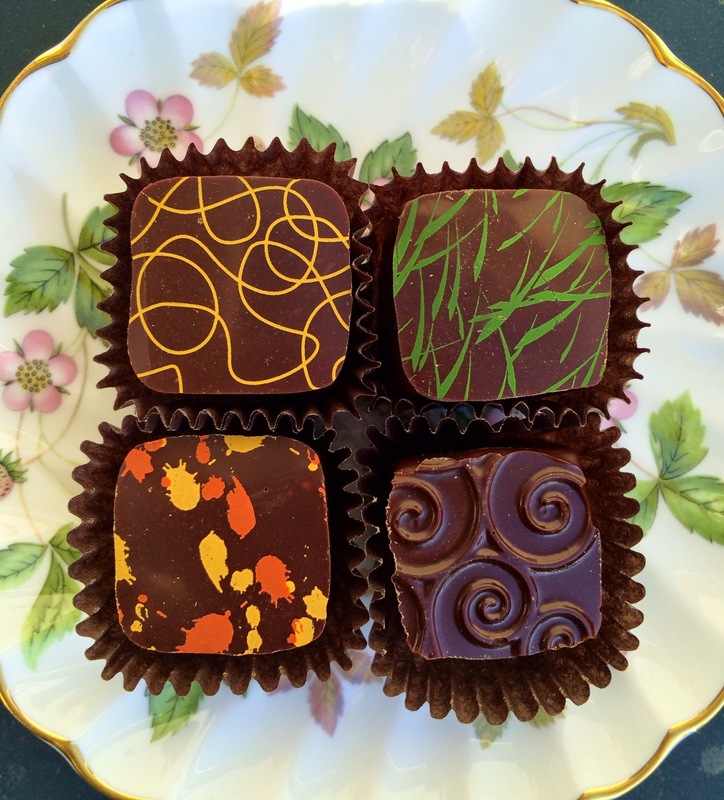 Although just a small family-run operation based in Oakland, the handcrafted chocolates are on par with the very best you'd find in Paris. In fact, a Parisian chocolate boutique owner once discovered Barlovento's Mayan Hot Chocolate truffle and sold it to her discerning clientele. Yet at heart, Barlovento is a local company with a loyal following around the San Francisco Bay Area. When sampling the truffles, be sure to try Barlovento Chocolates' signature flavors: Fresh Mint, Meyer Lemon, Creme de Mure (blackberry), Chile de Arbol y Apricot, and Cardamom & Honey. Peter Brydon's personal favorite is the Creme de Mure, and he admits to eating around three ounces of chocolate a day (including a tea and milk chocolate break at 10am daily and dark chocolate after lunch). The life of a chocolatier sounds pretty good. I'm ready for a career switch! These are just beautiful! And I am thrilled to see such a wonderful small business popping up in my old town of Oakland. Almost too pretty to eat! Liz, thanks for your comment! I agree with you, this was one of the most inspiring stories that I've come across while working on this blog. It's wonderful to see a small business owner succeed at something he loves! Also, the chocolates are simply scrumptious!! It's definitely worth seeking out these truffles at your local farmer's market.